Combine all the vegetables with the olive oil in a 2 qt. microwave container, and microwave covered at P10 for 2-1/2 minutes. Spray a shallow microwave glass pie pan (9" round or 6" x 10" rectangular) with the vegetable spray and add the vegetable mixture. Beat the eggs and season with salt and pepper. Pour the egg mixture over the vegetable mixture and stir gently to combine. Microwave partially covered to let steam escape at P4 for 18 minutes. 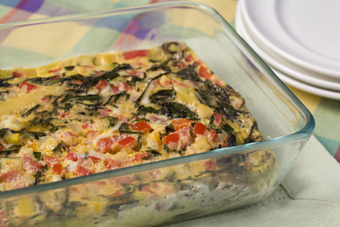 Cut the frittata into wedges and serve hot or at room temperature.